The 10-Day Southern Italy tour focuses on the regions of Campania and Puglia. 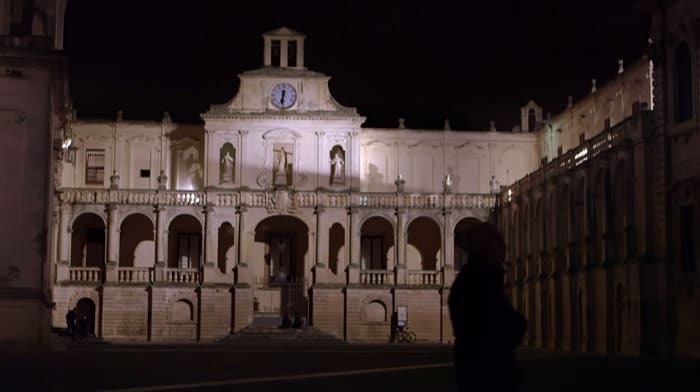 The Campania and Puglia tour visits Otranto, Alberobello, Lecce, Ostuni, and Bari. This all-inclusive Southern Italy Tour begins in Naples and ends in the resort town Sorrento in the region of Campania. The area’s rich history lends itself to the escorted tour experience. You’ll be escorted around southern Italy visiting Lecce, Alberobello, Otranto, Ostuni, Paestum, and Bari. This southern Italy escorted tour daily itinerary explores the patchwork of cultures that colors the Italic peninsula to today. You’ll enjoy rich architecture, music, food, culinary traditions, and culture. Families, friends, groups, and singles will all enjoy history’s great civilizations coming to life on this 10-Day Southern Italy tour. Submit the form or call 800.227.1577 for the price of the all-inclusive southern Italy Campania and Puglia tour with airfare from your preferred departure city and for more tour information. Otranto – Time to enjoy this town located at the tip of the heel if Italy’s boot. Paestum – Visit the best preserved ancient Greek Doric Temples in the world. Check the box next to the Campania and Puglia tour that you would like to join. Travel through Mediterranean history meeting the ancient Greeks, ancient Romans, Byzantines, Normans, Carthaginians, crusaders, Bourbons, and Ottomans on this comprehensive all-inclusive southern Italy tour. This escorted southern Italy tour provides an in-depth and authentic southern Italian vacation experience. The day-by-day itinerary provides time for your expert Italy tour guide to bring you through the area’s rich history and culture. Destination southern Italy’s largest city Naples. Guided sightseeing this morning features the remarkable Triumphal Arch of the New Castle, St. Charles Theater, Galleria Umberto, and the semicircular Piazza Plebiscito. Highlight is a visit to the magnificent PALAZZO REALE, royal residence of the Bourbons from 1734-1860. Since 1925, it also has housed the National Library. Afternoon and evening at leisure; choose from our optional excursions to make the most of your stay. Enter the Apulia region and stop at the imposing 13th-century, octagonal citadel CASTEL DEL MONTE, a UNESCO World Heritage Site built by Emperor Frederick II. Enjoy a guided visit to discover its uniqueness. Arrive in Bari, where you may wish to join an optional dinner outing. During your guided sightseeing, enjoy a walk through the OLD TOWN, and Globus Local Favorite taste local focaccia. Stop in attractive Ostuni, often called the “White Town,” a charming example of Mediterranean architecture. Its Old Town is located on top of a hill and fortified by ancient walls. Globus Local Favorite Stay overnight on the beautiful and peaceful Tenute Al Bano Carrisi estate, situated in the Salento countryside. Savor local produce and wine from the estate’s vineyards, as well as olive oil and homemade pasta. Soak up the local atmosphere as you relax around the pool area. You may even get to greet Al Bano himself—famous for his renowned songs Felicità and Ci Sarà. Arrive in Lecce, the “Florence of the South,” where you discover the lacy stone buildings and baroque squares during your guided walking tour. Globus Local Favorite Taste local pasticciotto and almond coffee. Time to explore this pretty town before continuing to Otranto, at the heel of the Italian boot, surrounded by its imposing defensive walls and dominated by its cathedral. Return to Cellino San Marco. 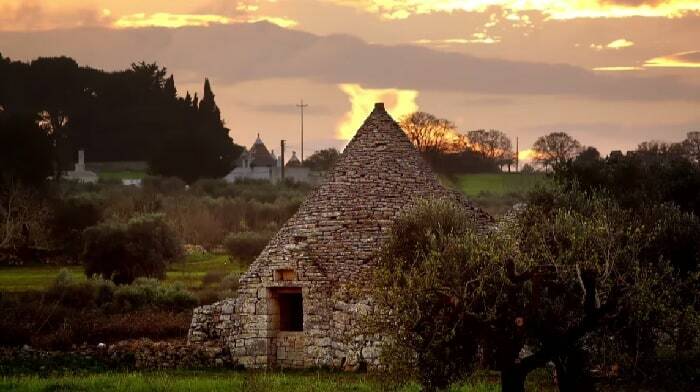 In Alberobello, follow your Local Guide for a visit to a TRULLO, one of the conical houses famous for their beauty and unique characteristics. The structure assures excellent indoor climate control—cool in summer and warm in winter. Continue to Castellana Grotte for your overnight stay. Paestum, or Poseidonia, named in honor of the Greek god of the sea, was founded in the 6th century. During your visit of the ARCHAEOLOGICAL SITE with a Local Guide, see the ancient Greek temples dating back to 600-400 BC. Afternoon arrival in the charming, seaside resort of Sorrento. After your orientation walk with your Tour Director, there is the opportunity to join an optional excursion to the Amalfi coast. This evening, enjoy a farewell dinner at a local restaurant to celebrate the success of your vacation. 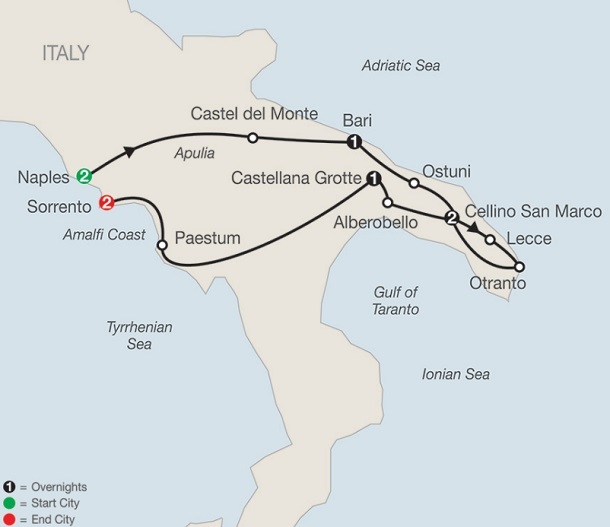 Click here to review the southern Italy tour accommodations. To browse more trips to southern Italy click here.